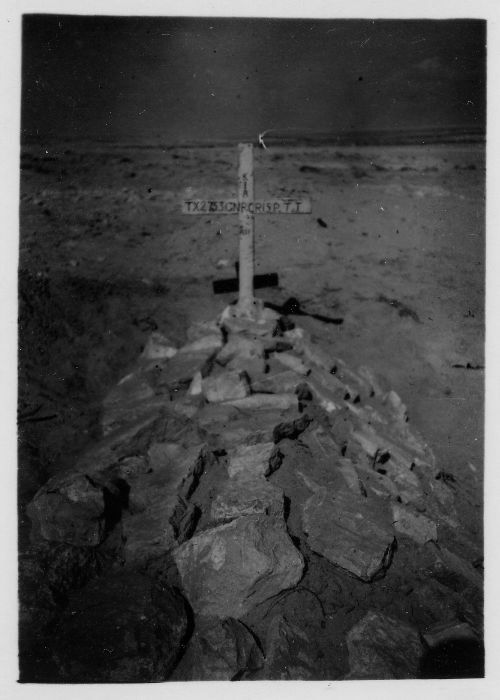 The caption reads "Tom Crisps grave after we had buried his remains. El-Alamein Egypt. Nov. 1942" Collection of Ron Ware. Tom Crisp wasn't buried immediately. In fact it was four months after his death. This is explained in a caption to another print of the photo. Ron Ware states "EARLY GRAVE OF A SIG FRIEND (TOM CRISP) TOM TOOK MY PLACE IN THE CARRIER ON F.O.O. WHEN I WENT OUT WOUNDED. HE WAS KILLED NEXT MORNING. WE BURIED WHAT WAS LEFT OF HIM 4 MONTHS LATER UNDER SHELL FIRE. I INSCRIBED THE CROSS WITH A PENCIL BRUSH AND INK."